If you have a sensitive stomach or suffer from IBS but want to follow a vegetarian diet, then this is the perfect book for you. 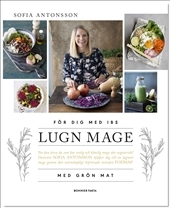 It is bursting with dietitian Sofia Antonsson’s delicious recipes that are based on the dietary treatment FODMAP – one of the most effective methods there is for alleviating the symptoms of stomach disorders. You start by eliminating the most common foods that cause symptoms and then slowly reintroduce them so you can see exactly which ones are causing you problems. And as well as all her wonderful recipes, Sofia also helps you to understand more about how FODMAP works.